Jess Crafts Digitals had a new release on Friday. So I had to color up this cute little raccoon celebrating with a warm cup of coffee! 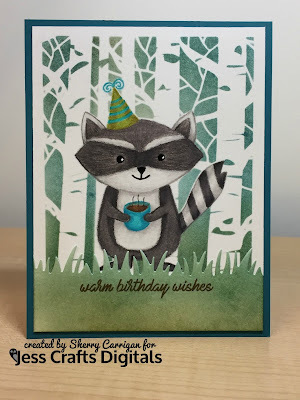 She also has a free digital stamp for the Coffee Lover Blog Hop over on the Jess Crafts Digital Blog. Apparently I failed to hit the Publish icon on my blog, so this is late. My sincere apologies. I had a show to work Thursday thru Saturday so too many irons in the fire. I wanted to try some no line coloring with digital stamps, so when I brought the image into my word processor, I change the opacity of the line art to very faint. I was pleasantly surprised with the outcome. Video below of the process and all supplies listed below. Thanks for stopping by!